Room To Read is a nonprofit on a mission. They focus on two areas where they believe they can have the greatest impact: literacy and gender equality in education. Working in collaboration with communities and local governments across Africa and Asia, their programs develop literacy skills and reading habits amongst primary school children as well as supporting girls seeking to complete secondary school with the life skills needed to succeed both at school and beyond. When the staff of Room To Read learned about Chimbundire Basic School in Katete, Zambia, they knew they’d found good partners. The school’s teachers and administrators hadn’t let the lack of resources get in the way of providing the highest possible quality education for their students. The school had implemented a once a week reading program, holding story sessions under a tree on the school grounds. The 1,000 students there had so much enthusiasm for reading that Room To Read knew that with a library in their midst, the results could be fantastic. The packed classrooms of 114 each left little room for spare bookshelves, so instead, Room To Read and Chimbundire leaders planned a new building to house both a library and additional storage for the school. Community leaders got together as architectural plans were made to discuss how they could contribute significantly to the project’s costs, a requirement for partnership with the charity. Despite their extremely rural setting’s limited resources, they came up with a plan for each village served by the library to dedicate an entire day to molding bricks for its construction. The villages traded off, each molding on a different day, rotating until they had enough bricks for the entire project. When the building was finished, Room To Read then stocked the shelves and rooms with brightly-colored books, chairs and desks and conducted training sessions for the next three years for teachers, administrators and community members on library management, including how to level books and engage their communities. While students still take books out to read under the old “library tree,” they now have more options. With each classroom having a weekly library period to find and check out books there for reading in their spare time. Teachers have begun taking time out from school activities to conduct activities in the library as well, stimulating student and community involvement. 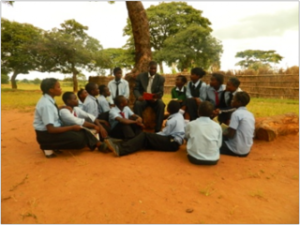 Click here to learn more about Room To Read’s work in Zambia.